A large audience attended a panel presentation titled Solar cooking: Renewable energy at home for a greener, healthier and wealthier world, organized by SHE at the Washington International Renewable Energy Conference on March 3. Executive Director Marie-Ange Binagwaho spoke on SHE’s behalf. Two days later, President Bush addressed the conference, describing his Administration’s efforts to promote renewable energy. The solar cooking session, which also featured speakers from the Sun BD Corporation (maker of the Tulsi Hybrid solar oven), Sun Ovens International (maker of the Global Sun Oven), the Solar Oven Society (maker of the SOS Sport) also gave attendees an overview of the principles of solar cooking, and outlined each organization’s strategies for disseminating the technology in the U.S. and globally. 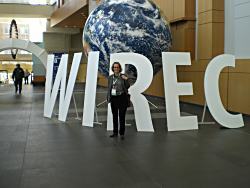 WIREC was sponsored by British Petroleum, the American Council on Renewable Energy, and the U.S. Department of State, among others. Some helpful advance promotion of the WIREC solar cooking session was posted on Energy Smart, a content-rich blog devoted to environmental and energy issues. It’s creator, Adam Siegel, wrote an excellent overview of the solar cooking scene today. Click here to read it.